You wipe runny noses, drive the carpool, sit through recitals and/ or wake up for midnight feedings. You do more in one day than many people do in a week, and like Victoria Beckham, you do most of it in towering stilettos. Today, you deserve flowers... not the kind that wither and die (and require effort on your part to keep alive), though. Instead, you're entitled to a floral pair of shoes. These satin Gianmarco Lorenzi platforms are like a corsage for your feet... and then some. With a needle thin 5.1 inch heel, 1.5 inch platform, they say you have no intentions of running around today. Instead, you'll strut, and the royal blue color, combined with the magenta and blue florettes will have all eyes on you. Though you'd normally drink mimosas at brunch, replace them with Wild Hibiscus Sea Urchins today (recipe & image by Danielle Tatarin via inovision.ca). 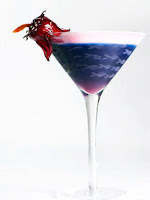 The name may sound odd, but there's nothing fishy about the taste of this cocktail made from Van Gogh Vodka, Campari, Hiram Walker Blue Curacao, lime juice, soda water, honey foam and Wild Hibiscus syrup. It'll be semi- sweet, a bit floral and a tad bit tart. Send the kids out with family members and sip away all day. Remember to hydrate, though, because tomorrow's back to the normal chaos.